The Page Editor is a dialog box within the Template Editor that allows you to add, delete, reorder and replace pages in your form template. You can think of these pages as the background of your forms, with the digital form fields super-imposed on top. To access this functionality, simply open your template in the Template Editor and click the Page Editor button at the top to launch the Page Editor dialog box. There are many situations where you may want to change the page makeup of an existing form. For instance, you may be building a single digital form using multiple PDF forms. Or you may want to add a new section to your form. Or you may simply want to rearrange some of the information in the form, pushing some pages forward and others back. The Page Editor lets you do all of these things. From here, you can either drag and drop the file containing your new page(s) into the designated area, or click Browse Files and select your file in the dialog box that pops up. JPG and PDF file formats are supported. For JPG images, the image will be added as a page at the end of your form. 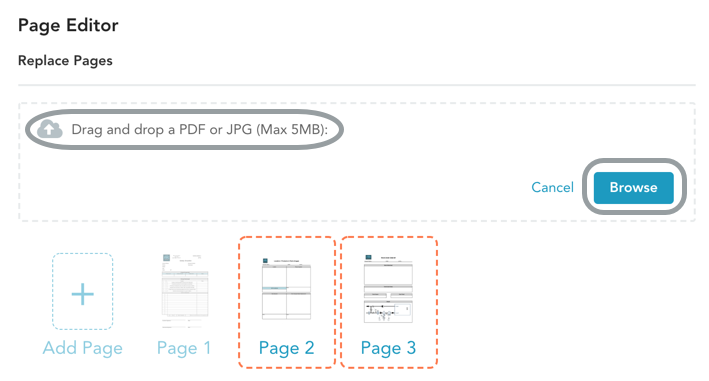 For PDF files, all pages within the file will be added to the end of the form. Note that you can only add one file at a time here. To delete a page, simply click the page(s) you want to delete**, then click the Delete button that appears at the top. In the example below, we have selected pages 1 and 3 for deletion. Note that deleting a page will remove the fields on that page from the Template Editor’s preview area, but retain them in the Template Fields section of the Template Editor’s left sidebar. This way, you have the option of bringing those fields back into the form on a different page by dragging them in from the Template Fields section. 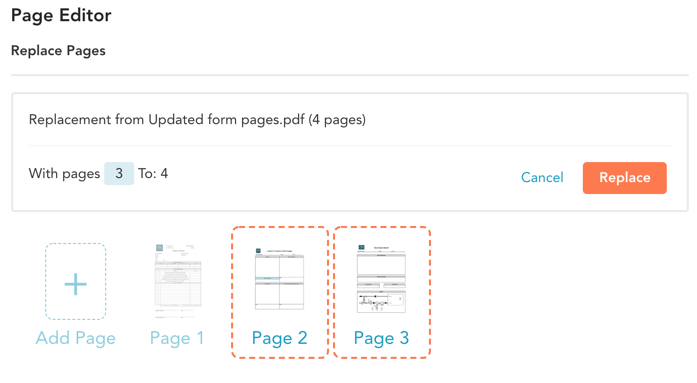 To change the order of pages within your form template, drag and drop the page thumbnails to the desired location. When you replace existing template pages with new ones, you only replace the background of each page, and retain the digital form fields set up on top of it. So the replace operation is not the same as deleting the old pages and adding the new ones — a delete-and-add will not retain your fields on the pages. The most frequent use case for page replacement is when you need to make a small change to an existing form. For instance, suppose your multi-page form contains a job safety checklist, and you need to insert two additional items into the checklist. The best way to do this would be to make the change to your original form PDF, and then replace the existing template page with the new one. To replace template pages, click the page(s) you want to replace**, then click the Replace Pages button that appears at the top. In the example below, we are replacing pages 2 and 3. From here, you can either drag and drop the file containing your new page(s) into the designated area, or click Browse Files and select your file in the dialog box that pops up. We support PDF and JPG file formats. It is often useful to download your form template backgrounds as a PDF. For instance, you may want to make a change to the PDF and re-upload, or use a page from an existing form in a new form. To download template pages, click the page(s) you want to download**, then click the Download as PDF button that appears at the top. In the example below, we are downloading pages 1 and 3. 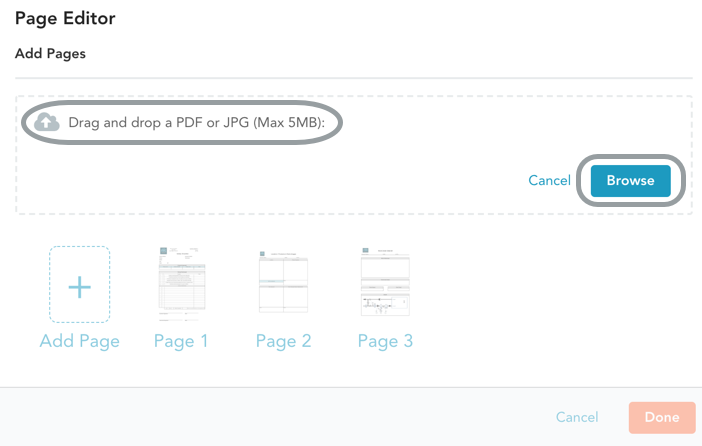 The selected pages will be downloaded as a single PDF; the PDF name will be the same as your template name. **Note: To select multiple pages in the Page Editor, hold down the [Command] key on a Mac or the [Control] key on a PC while clicking page icons. To select a range, hold down the [Shift] key while clicking.